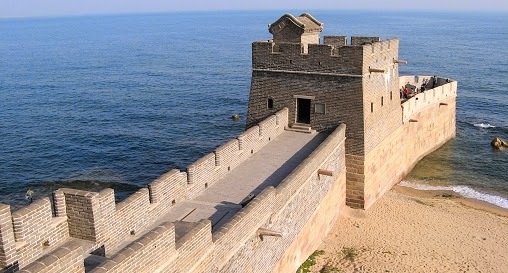 Laolongtou of the Ming Great Wall is an estuary of the Bohai Sea, and 4km to the south of Shanhaiguan. When Xu Da, a famous general and one of the founders of the Ming Dynasty began construction of the Great Wall, he chose the place as the starting point in the east. Since the Great Wall is like a crouching dragon climbing voer the mountains and finally extending its head into the sea, it has been called “the Old Dragon Head”. In 1579 at Laolongtou Qi Jiguang directed the construction of a 23 meter-long stone city extending into the sea, called “Ninghai City”. In Ninghai City the first pass of the Hebei Great Wall “Nanhaikouguan” and the first watch tower “Jinglutai” were built, and later the lofty building “Chenghailou” was constructed on the rampart. The strategic topography of Laolongtou and an amphibious defensive network of mountains, sea passes and cities together formed an important strategic pass that could clutch the gorge of Ji Town and Liaodong Town. Laolongtou is composed of the stone city, Jinglutai, Nanhaikouguan, Changhailou, Ninghai City, the Seaside Great Wall, etc. Chenghailou was the tallest building of Laolongtou. It was a battlement in its initial construction. When the Qing Regime had unified the Central Plains, it gradually became a famous resort for literati to watch the sea and express emotions. Many emperors of the Qing Dynasty had their rounds there, ascending them Kang Xi, Yong Zheng, Qian Long, Jia Qing, and Dan Guang left their writings and paintings there.